This is a must-read for music lovers the world over. 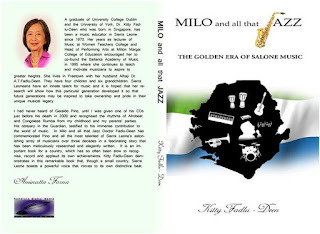 It is a book that connects the development of Sierra Leonean cultural music and its sources of inspiration from the African Continent and beyond. Above all, it recognises the influence and inspiration with which Sierra Leonean music continues to touch the world. As a music professional from South East Asia, with an appreciation of the international music scene, the vastness and depth of musical offerings in her adopted country were an inspirational discovery for Dr. Fadlu-Deen. Part of the expression of this inspiration is her co-founding of the Ballanta Academy of Music, Freetown in 1995.